I’ll be honest, I’m more of a melted cheese, chocolate, and fresh bread kind of person…all the things my naturopathic doctor says for me to avoid. I mean, I’m a ketchup person – never mustard! So pickled, soured, fermented foods have not been on the top of my list for favorite foods. But I live in a house of people who love things like this fermented dill pickles recipe. And low and behold, I’m starting to get into the hang of it, and good thing too! Fermented foods are SO incredibly good for you! Well, everything depends on how it’s made and with what. But traditionally, foods fermented with wild bacteria or yeast are excellent for your gut. Your intestines are the powerhouse of good bacteria in your body. This is the bacteria that helps you digest properly, helps your immune system stay strong. There should be about 3 pounds of good bacteria growing in your gut (1). Wipe that out, like we do when we take antibiotics (which I’m not saying are not necessary sometimes), and our bodies are in deep trouble, which is why we take probiotics during and after any antibiotic treatment. Lacto stands for lactobacillus, the name of a type of bacteria that grows on plants and in our intestines.There are different types of lactobacillus bacteria, one is the lactobacillus acidophilus that you may see on a yogurt label. Through the fermentation process, this wonderful bacteria converts sugars into lactic acid (whether those sugars be in cucumbers, cabbage, or sourdough bread. This lactic acid makes sure no bad bacteria can grow. So your fermented foods are safe! Though we must make sure that there is enough lactic acid. Sometimes some bad bacteria can be introduces, which I will talk about below. According to Cultures for Health, lacto fermentation also produces antibiotic and anti-carcinogenic qualities in our foods by raising the levels of certain vitamins and enzymes. ***Note*** Your pickles or sauerkraut from the store are not fermented, but are pickled in vinegar. This loses a lot of the good qualities that you would have by fermenting your foods. So, what are we waiting for. Let’s make some Fermented Dill Pickles! Lacto Fermented Pickles are a healthy snack for your gut. Place the salt, filtered water (it cannot have chlorine in it), cloves, dill, and pepper in jar. Water will overflow, but that's fine. Do it is the sink so when you are done the water is to the brim. Make sure no cucumbers are touching the surface of the water (place a leaf on top to help). You can place plastic wrap over the jar, touching the water to help prevent air from touching any cucumber as they shift. Or, if your jar mouth is wider, place a zip-top bag with water in it on top of the jar to weight the pickles down (you may need to tape the bag onto the jar). Let sit for 3-5 days on your counter top. It takes less time the hotter the weather. They'll start to produce bubbles. You'll know it's ready when the bubbles stop. I find that my pickles are very firm when they are left as spears. Without grape leaves, sliced cucumbers tend to be a lot softer. Make sure your hands and jar are sterilized, otherwise you will introduce bad bacteria. If you get some cloudiness, that is perfectly normal. It has to do with your salt ratio. White film on the top means you are growing a certain kind of yeast which is fine. Skim it off. Your cucumbers are probably touching the air. Any pink or red or other color growing in your jar – throw the jar out. You did not have a good salt ratio and you’re growing harmful bacteria. Hi! I just found your blog through the Homestead Barn Hop. I am fascinated with fermented foods, but haven’t been brave enough to get started yet. 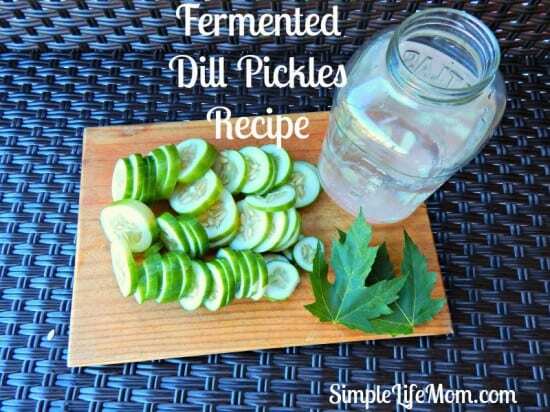 I did make fermented dill pickles once for hubby and he much prefers them to ones that are water bathed in vinegar. I have made yogurt, but my family doesn’t go through it fast enough to justify making it often. I need to find more ways to use it up. 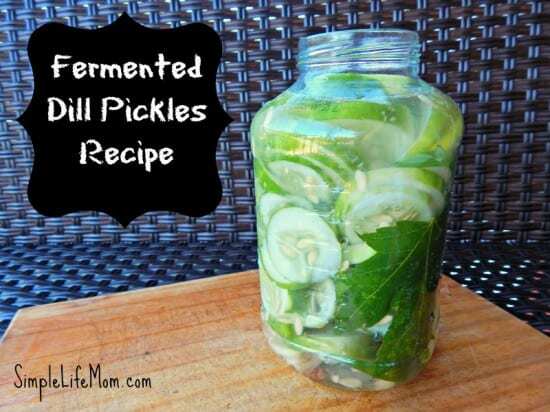 I definitely may try another round of fermented pickles with your recipe. Thanks for sharing it. I make fermented pickles a lot but I didnt realize that horseradish leaf would keep them crispy as well as a grape leaf. Thanks, I will try it! Thanks for this very valuable information. Fermented foods are so important to a healthy life and so many of use don’t eat them or even realize the importance of them. Thanks for sharing with Real Food Fridays. Pinned & twitted. I hopped by from Real Food Fridays to see your fermented dill pickles. Fermented foods are so important to our health. I got away from pickling but your wonderful recipe reminded me how easy it is to create easy pickles. I plan to make these soon. I love your Fermented Dill Pickles, they will be great! Thanks so much for sharing your awesome post with Full Plate Thursday. Have a great week and come back soon! I’ve been reading more and more about the benefits of fermented foods, something I learned about about 14 years ago. I love that healthier options are becoming more mainstream. Thanks for sharing at The Yuck Stops Here. I’m with you on the cheese and chocolate… But I do enjoy a good homemade pickle, too. 😉 I’m going to feature these at this weekend’s Savoring Saturdays. Can’t wait to see what you share this weekend! I need to get more fermented foods in my diet. I thought that lacto-fermentation usually used whey? It’s been a while since I fermented anything, but when I did, I usually used Sally Fallon’s Nourishing Traditions. Where does the lactobacillus bacteria in this recipe originate from? The type of bacteria grows naturally from the bacteria in the air. Whey is one way to add extra nutrients to your fermented foods, but is unnecessary for the natural growth. It’s the same bacteria as “natural yeast” for sourdough bread. Sounds good! I love pickles!! Silly question – if you don’t have those leaves in the garden, how can you find them? Oh! Of course! I didn’t realize it would just be the neighborhood oak trees – YES…oodles! Thanks so much! I have been out of town all weekend attending a Women’s Retreat but wanted to stop by to give you the good news. Congratulations,your recipe is a Top Ten this week on Full Plate Thursday. Hope you have a great week and enjoy your new Red Plate! when you say grape leaves, what exactly do you mean? From a grapevine? Yes, you can buy them in some Greek and Italian markets or online if you don’t have access to any locally.